Fiscal Sponsorship and incubation of projects: Past and current projects include Red Bike, Taking Root, Outdoor Adventure Clubs, Cincinnati Recycles, Ohio Valley Food Connection, and Produce Perks. 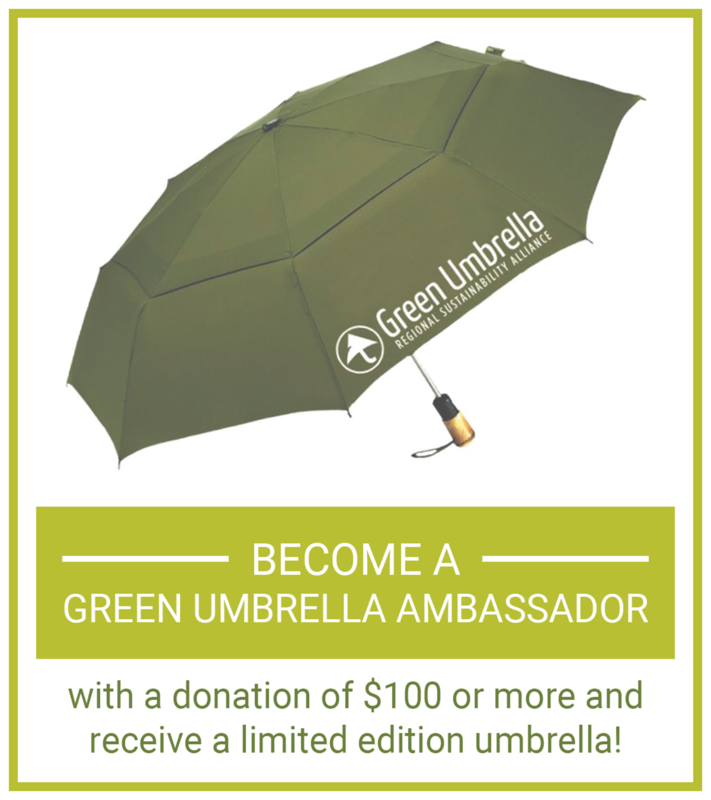 Green Umbrella is a 501(c)3 nonprofit organization, Federal Tax ID 31-1770299. Thank you for your support! Did you know that we accept gifts of stock? For information about donating gifts of stocks, bonds and mutual funds, please visit here. Please note: If your donation is going to a specific program or event, please specify in the "Comment" box below. 1. Start by visiting smile.amazon.com. If this is your first visit, you’ll be prompted to search for the charity you want to support. Just search for “Green Umbrella” and click the “Select” button. If you’ve already selected another charity, you can change your support to Green Umbrella by clicking the “Supporting:” link in the upper left-hand corner of the page, and clicking the link to “Change your charity” on the box that pops up. You can change your charity as many times as you want. 2. Then, a portion of every qualifying purchase you make on AmazonSmile will support our work! After you select Green Umbrella, you’ll receive confirmation of your selection. From then on, every qualifying purchase you make at AmazonSmile will help support Green Umbrella! Please note: Purchases made through www.amazon.com will not benefit GU, so be sure to start at smile.amazon.com every time—there’s no extra cost to you. 1. Start by registering online at krogercommunityrewards.com. Click on "Sign In/Register"
New online customers: Click on SIGN UP TODAY in the ‘New Customer?’ box. Sign up for a Kroger Rewards Account by entering zip code, clicking on favorite store, entering your email address and creating a password, agreeing to the terms and conditions. You will then get a message to check your email inbox and click on the link within the body of the email. Click on My Account and use your email address and password to proceed to the next step. Registered customers: Click on Edit Kroger Community Rewards information and input your Kroger Plus card number. Update or confirm your information. 2. Enter Green Umbrella's name or NPO number (11526) OR select our organization from list and click on confirm. To verify you are enrolled correctly, you will see Green Umbrella on the right side of your information page.